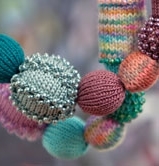 Create your own unique knitted beads and use them to craft your own one-off jewellery pieces. Reflect your personality in your designs using embellishments and luxe yarn, then show them off as a necklace or bracelet. Bring some sets of fine double-pointed needles, 2.25mm, 2.5mm and 2.75mm, and pen and paper for note-taking.